First, a bit of info about rebates for energy-efficient appliances. For those who bought Energy Star washing machines in NJ last year, the deadline for applying for a $50 rebate is Jan. 31. If you have a refrigerator that still works but that you want to recycle, there's an ongoing service that will pick it up for free and later send you $50 from the NJ Clean Energy program. Other rebates available for energy star products are here. Rebates are made for people who are either very organized or completely scatterbrained. Organized people will quickly send in the forms and remember to inspect subsequent mail for the check. Disorganized people will immediately lose the rebate form and forgot about it altogether, yet continue congratulating themselves on having gotten a great deal on the product. Place form in the "Get around to at some point" container on your desk. Mine's ceramic and looks pretty nice when periodically excavated from the surrounding pile of papers and accumulated dust. Periodically check deadline on form. Register surprise that the deadline has not been missed. After a sufficient number of weeks/months have passed, begin search for receipt to go with rebate form. Assume it is buried in with other papers on desk. Clean desk, but find no receipt. Commence with mild mental self-flagellation for not being more organized. With two days to spare before the deadline, remember there's a file named "Washer/Dryer" in the file cabinet. Find receipt in the file. Congratulate self on tricking self into cleaning desk. Intimidated by rebate form, delay filling out one more day. Decide that $50 for a half hour spent getting form filled out and in mail box (optimistic projection) is worth it. Be gladdened that massive washing machine doesn't need to be turned upside down to find serial number required on form. Make copies of receipt and completed form. Note that NJ Clean Energy Program reserves the right to go broke prior to the rebate deadline. Remember who is governor of New Jersey. Place in envelope with address and stamp, and seal. As soon as envelope is sealed, realize that the copy of the rebate form is in envelope, not the original. Consider reopening envelope to put in original form, so they won't have an excuse not to send rebate. Decide to send anyway, and hope for the best, and that the NJ Clean Energy Program is still funded. Sometimes solutions present themselves for problems we aren't even aware of. In the words of Steve Jobs, "A lot of times, people don't know what they want until you show it to them." Jobs excelled at inventing and reinventing products that consume energy. Great stuff, but what the world really needs is someone equally as brilliant at inventing and reinventing products ordinary people can use to generate their own energy. As a model for reinventing home heating, I nominate the wood stove. This 1978 Vermont Castings "Vigilant"--a good name for a wood stove--came with our house. Our first impression was that it seemed to be standing in the way of a nice fireplace. But we gave it a try, and over time, as we've learned how to use it, the wood stove's abundant, radiant warmth has proven in many ways superior to the comparatively sophisticated furnace in the basement. How have we come to love this woodstove? Let me count the ways. It heats the whole house. Somehow the heat generated in the living room goes through doorways, turns the corner into the kitchen, and heads up the stairway to the bedrooms. It creates a gradient of heat, allowing everyone to find their own comfort zone. No more tyranny of the thermostat dictating a uniform temperature that all must live with. It burns locally grown energy, with a carbon footprint that is actually negative. Not only does it reduce the need for fracked natural gas, but the wood it burns (arborists taking down trees in the neighborhood are often glad to give us the wood) would otherwise have been hauled to the composting center for grinding up by fossil fuel-burning machines. Wood, whether it's burned or allowed to decompose, is simply releasing back into the air the same carbon it absorbed over the previous decades of growth. Thus, no net increase in atmospheric carbon. With no moving parts to wear out, this wood stove needs no servicing beyond annual cleaning of the chimney. Unlike the furnace in the basement, a wood stove can dry wet mittens, cook soup, and fry eggs. Again, the gradient of heat comes in handy. Its varied surfaces can bring water to a boil or gently warm a cup of coffee. A wood stove is "unplugged", oblivious to power outages, ready to warm a house and cook food through any power outage. It empowers us to glean our own energy from the local landscape rather than remain totally dependent on the grid. Beyond these practical aspects, a wood stove is elegant in its simplicity. It does for heat what a candle does for light, creating a focal point that draws you in. Normal lighting and heating in a house tend to be dispersed. A wood stove can even be said to have charisma, drawing us with its almost human qualities of great warmth and generosity. Its radiant heat warms body and heart in ways the tepid air emanating from the central heating's floor vents cannot. We got lots of tips on how to make it burn as cleanly as possible. A wood stove burns much cleaner and hotter than a fireplace, and radiates much more of that heat into the room. Newer stoves have secondary and tertiary burn chambers to maximize combustion of gases that would otherwise go up the chimney as pollution. My friend in air quality at the EPA tells me that a good sign is if no smoke is visible coming out of the chimney. Even with our older stove, we're able to achieve that with dry, well-cured wood and a good air supply. The front door in this photo is open to show how hot the mass of coals is inside, but efficient burning requires the doors remain closed so that a more focused air supply can be delivered through an adjustable air vent in the back of the stove. Our chimney sweep told us to load wood in through the top, which was counterintuitive. The powerful draft of the flu draws the flames back towards the chimney, making it safe to open this metal lid. Previous owners of the house installed a liner in the chimney, for easier cleaning and greater safety. A wood stove teams up well with the other local energy available--sunlight coming in through the windows in winter. I sing the wood stove's praises, but am also cognizant that it is not a solution that can be widely applied in a town setting. Why, one could ask, with the countless ways progress has given us to consume energy, has no one developed a way to capture the sunlight hitting a house and channel it into some radiant object in the living room we could all gather round? I'm imagining some attractive variant of the solar water heater. In the meantime, this elegant, radiant, charismatic creation from another century offers a template for reinventing the future. Dogs know that the best energy is local energy, whether it be sunlight streaming in through a window or the solar energy captured by neighborhood trees turned into firewood for the woodstove. Leo here has found the sweet spot where he can enjoy the benefit of both. No grid is needed for this wonderfully radiant heat, no fracking to feed the gas furnace, no drill-baby-drill extraction to feed the fuel oil tank, no blowing up of mountains in West Virginia to deliver coal-generated electricity to drive the furnace fan, no venting of climate-changing fossil carbon up through the chimney. If the world made more sense, if it had not been led down an unsustainable path by deceptively cheap energy from the underground, our homes would be heated largely by sunlight in the winter. Lacking a home oriented and designed to make maximum use of winter sunlight, we make do with what the windows allow in, what scavenged and well-cured wood can generate, and what insulation will keep from escaping. The furnace still runs, but less. One vivid memory I have is of visiting a homemade passive solar house in northern Minnesota. A bank of reused windows facing south, a large overhang to keep the sun out in summer, and a 55 gallon drum converted into a woodstove--these were the ingredients that made for cozy, light-filled comfort in the middle of a harsh winter. No moving parts to break down, and a kettle steaming on the stove to keep some humidity in the air. Another memorable, and far better known, passive solar house out that way is a Frank Lloyd Wright house in Madison, Wisconsin. Pertaining to this harvest of local energy, and the "sense of place" it can contribute to, the Princeton Environmental Film Festival will host a short documentary followed by a discussion of passive solar homes ("Passive Passion", Saturday, January 26, 4pm). Every once in awhile, one happens upon a place where the world makes sense. This scene at the Willow School in Gladstone, NJ may not look unusual, but underneath the pavement is a 30,000 gallon cistern that catches runoff from the building's roof. The water is treated on-site and then put to use for most everything but drinking. The building was built, in the jargon of environmentally enlightened design, to the LEED platinum standard, another building is LEED gold. I first learned of the Willow School through a presentation hosted by OASIS (Organizing Action on Sustainability In Schools) at the Princeton Public Library, and recently asked if I could stop by when I was up that way. With kids from pre-school through the 8th grade, their mission statement speaks of "the wonder of the natural world", respect, independent thinking, creativity, responsibility, and integrity--words that take on meaning in the landscape as well as the classroom. The first thing my tour guide, science teacher Michael Chodroff, pointed out was that their driveways have minimal curbing, so that runoff can be absorbed by the landscaping rather than piped straight into the local stream. The south-facing windows let abundant light and warmth in when the sun is angled low in the winter. Much of the woodwork was salvaged--the wood framing these windows came from a pickle factory that was being torn down. Fifteen years ago, I heard a speaker on LEED school design tell of how natural light from a row of south-facing windows high up in the ceiling has been shown to substantially improve student performance. Here, finally, I saw that knowledge applied. If you've ever wondered why your house isn't smart enough to tell you when the air outside has reached a comfortable temperature so that you can open the windows and get some fresh air, well, here's a device that senses outside temperature and gives kids "the green light" to open the classroom windows. In the hallway, there was a very impressive row of boots that suggested the kids were ready for any kind of weather. Turns out they play outside undaunted by what weather hands them. using their imaginations and the materials at hand. The resourcefulness and problem-solving abilities developed on the playground have beneficial effects in the classroom. Here, the root ball from a tree blown over by Hurricane Sandy became the side of a house. On the playground as in the buildings, local materials are gathered and put to new uses. Runoff from a field, rather than being directed to the nearest stormdrain, is put to use feeding a wet meadow of native wildflowers that surrounds one of the buildings. On rainy days, the kids can track and play with the water's flow. and emerges cleansed and filtered in a pond that is used for study. Contrary to the energy-intensive process most of our wastewater undergoes at a distant plant, this process requires no energy inputs and creates habitat. You might notice different colored beams in this cafeteria/gym/performance space. They got a call from a developer in Pennsylvania who had a barn he had to be rid of in a week's time. They salvaged the beams and re-installed them here. The building is as most of us are--a mix of old and new and everywhere we've been. Signs explain that the redgum wall boards came from a 1905 textile mill building in Memphis, TN. The heartwood pine roof rafters had an earlier career as part of an 1890 Seth Thomas Clock factory in Connecticut. Beech ceiling boards had been part of a tobacco factory in Kentucky. The building's insulation, as this cutaway shows, is recycled denim. Not sure about the gong, but the music program uses the Carl Orff method. Up in a spot in the rafters that might ordinarily boast past sports championships, a Green Ribbon Schools banner flies. Kindergartners can get into the swing of repurposing by collecting bottletops to send to Aveda. Even the lamposts have the look of having been somewhere else, and something else, in a previous life. The next building to rise will be a "living building", defined as a building that generates more energy than it uses. The founder, Mark Biedron, took a moment from his work on the design to tell me that the school aims to develop a sense of place. When they first obtained the property from Pfizer, they studied its geology, hydrology and history back to the glaciers and beyond. Some themes emerged, e.g. the land is between two watersheds, and on the edge of the last glaciers' extent, that are used in the classroom to help kids understand the meaning of where they are. The Willow School, then, finds use and advantage in many things that are elsewhere shunned--sunlight, runoff, wastewater, old building materials. Even suboptimal weather doesn't discourage the kids from outdoor play, as they use nature's discards to fashion lean-to's. In a world not always welcoming of dreams, here one has been realized, and is lived every day. May its students carry this most sensible of dreams far and wide. The 2013 Princeton Environmental Film Festival will begin January 24 and run for three weekends at the Princeton Public Library. Check out the schedule here. As part of the festival, I will be giving a presentation on the legacy of Oswald and Elizabeth Veblen on Sunday, February 10 at 11am. Oswald Veblen was a mathematician, nature lover and visionary who was instrumental in bringing the Institute for Advanced Study, Albert Einstein and many other famed scholars to Princeton. He also played key roles in early computer development and ballistics research during the world wars. Counter to the stereotype of a cloistered academic, Veblen's love of land motivated his successful efforts to save from development hundreds of acres of open space in Princeton. He convinced the funders of the Institute to acquire much of what is now the Institute Woods, and he and his wife donated 82 acres to the county to form Herrontown Woods in 1957, laying the foundation for open space efforts in the decades that have followed. He and Elizabeth Veblen left behind a house with "wonderful and unique" architectural features, on the edge of Herrontown Woods, that they willed to Mercer County to be used as a nature museum and library. Though the county did not follow through, and the house has been boarded up for more than a decade, the house and farmstead still attract dreamers such as myself, wishing to put it to public use. As if life was in danger of making too much sense, now they've gone and discontinued my favorite granola at the local health food store. PLU 10136, better known as Honey Gone Nuts, will soon be gone forever. I've tried all the others, but it's not the same. None has that special mix of bounce and balance, that combination of contagious spirit and low saturated fat. Honey Gone Nuts made me feel like I could let go and explore my wild side while eating breakfast. The times we had together, there at the breakfast table, with that old sidekick Coffee! Honey Gone Nuts had a stubborn side, to be sure. Due to some innate sticktoitiveness, it would often refuse to come out of the bulk container's spigot, necessitating a firm pat on the side to jar loose the contents. An employee had shown me the sweet spot, which, if properly struck, would set the contents to flowing. It was this inside knowledge that added to our special relationship. I worried sometimes that other customers with less initiative and understanding might be missing out on this blissful marriage of honey and nuts. And sure enough, that's why it is being discontinued. The stuff wasn't selling, the manager told me. Well of course it wasn't. Evidently, no one but I knew how to get it out of the container! I blame myself. I should have been more proactive, lobbied for special instructions to be provided, with a big "X" on the container's side saying "Strike here". But I didn't, and events have unfolded just as that little worry in the back of my mind suggested they could. As goes Honey Gone Nuts, so may go many worthy inventions for lack of promotion, songs left unsung for lack of a voice, solutions not given a fair shake, thoughts unwritten because no one could find the words. Honey Gone Nuts demanded more patience, more perseverance than the world was willing to give. And now it's gone. Nuts! Various claw marks can be found on Princeton's residential streets from time to time. Some speculate that the claw marks appear when one or another of the many tiger statues in town comes to life at a particular phase of the moon, prowling the streets by night as gentle Princeton wisely sleeps. But no. Careful observation by a sleuth posing as the family's designated dog-walker revealed that the marks are in fact the work of a curiously charismatic, clawful contraption on a quixotic quest to clear the streets of cast-out clutter. Despite its superheroic strength, The Claw is doomed to fail. and increase employment opportunities for earthworms. And yet one city had the audacity to put the endless dumping of yardwaste to a vote, and ended up replacing The Claw with rollout bins except after storms and during fall leaf season. Sacramento's heedless attempt to keep streets clean and save money unfairly targets Sisyphus and his many emulators, who would find their Sisyphean qualities endangered if relegated to part-time work. In a world where entrenched problems resist solution, or where life, politics and/or ideology keep a problem and its solution from ever getting together, it's an uncanny feeling to envision a solution and then have it appear, all set and ready to go, having somehow eluded the forces that would customarily spoil the matchmaking. For instance, when we moved into a house fifteen years ago that was set higher than the neighbors, it finally occurred to me that there should be shades that can be adjusted to cover the bottom of the window, so we could have privacy but also light and a view. What a surprise to find out that such shades had already been invented and were available. Problem solved. When observation showed that recycling receptacles get filled with trash if they are not consistently paired with a trash can, and that hundreds of trash cans along the streets, in parks and in shopping centers in Princeton lacked a companion recycling bin, it seemed the world needed a retrofit. The recycling bin must be attached to the trash can, to insure they remain paired, yet it must be easily flipped over to empty out the contents. Much to my surprise, such a pairing appeared in borough parks a few years ago. It may not be pretty, but it works. 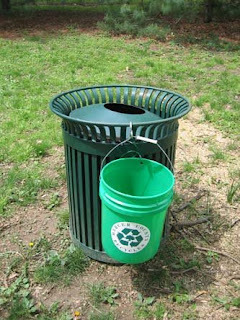 The next step is to design one that is attractive and versatile enough to fit, and fit in with, all the other trash cans in town that still stand alone, eating recyclables for lack of a partner. My cornbread went through a prolonged era of recurrent dryness, never achieving the moist texture of the pre-made at stores. Though our cookbooks offered no ideas, it turned out that the wise Indian chief had anticipated my problem and had been holding the secret of success all along, on the back of the package. More egg, more oil, less milk, slightly lower baking temperature. Problem solved. Here's to the merry matchmaker. May its visits be many. New Jersey has a state climatologist, which is to say there's a professor at Rutgers named David Robinson who has the title. As with other professors at Rutgers, he has been very helpful, responding to periodic inquiries, and there's an excellent website where you can get updates on New Jersey's changing climate. This post, entitled "Top 10 NJ Weather and Climate events of 2012", makes interesting reading. The deadline for providing initial input "for setting directions and priorities" for the new town of Princeton was January 9, but I'm leaving the original post below in case the link still works. 1. Princeton needs to be a leader in changing lifestyles to slow climate change. A distinction by town leadership needs to be conveyed to the public, that though the uses of fossil fuels, e.g. staying warm and getting where one wants to go, are ethical, the fuels themselves, by pumping carbon from underground into the atmosphere and thereby contributing to sea level rise and radicalization of climate, are not ethical. We as consumers are caught in this contradiction, a situation that wears on us as people who wish to do the right thing, and that will incrementally and irrevocably alter life for us and all to come. If Princeton is not going to be a leader, with all of its resources and experts across Nassau St. confirming what a huge problem we are contributing to, then who will be? The town should analyze all of its services and figure out how to reduce fossil fuel use, and it should be an advocate not for a sprinkling of pilot projects but for broad and meaningful change that will be an inspiration to other communities, to the state, and beyond. 2. Develop small, attractive signs that homeowners who compost their leaves in their backyards can put in their front yards to encourage their neighbors to do likewise. Emphasize cleaner, safer streets, and the ease of piling leaves in a back corner of the lot. Otherwise, neighbors imitate the most visible practice, which is to dump leaves and yardwaste in the street year-round. 3. Shift to uniform rollout bins for trash, recycling and yardwaste. For yardwaste, rollout bins are much easier to fill, easily pulled around the yard, will accommodate the great majority of growing season yardwaste now being dumped on the pavement, and can augment bags during fall leaf season. Consider the case of Sacramento, where use of the Claw will be reduced to fall leaf season only, to be replaced by rollout bins. Rollout bins for recyclables will reduce mosquito breeding in the summer, windblown recyclables on windy days, and back problems for workers who currently have to lift recyclables. Rollout bins for trash have the potential to be identified and weighed as they are being lifted into the truck, allowing the option of having residents pay by the pound for trash collection. Mayor Liz Lempert and the Princeton Council is soliciting input from ALL members of our community to guide them in setting directions and priorities as they proceed with their agenda-setting process. The new government is asking each of us to provide written feedback and share our "suggestions and ideas, be they great or small" about what we believe needs to be done to make our community even better than it is today. We are advised that the deadline for our input is now very short -on or before Wednesday January 9, 2013. One PF participant suggests that you first write up your ideas using your word processor and then copy/paste the text into the online feedback form. When Hurricane Sandy hit, Princeton's wastewater treatment plant lost power like everyone else. That's a big deal, because sewage doesn't miraculously stop flowing, and a powerless treatment plant means 13 million gallons of raw sewage a day pouring straight into the Millstone River. Fortunately, the Stony Brook Regional Sewerage Authority, as it's properly called, was able to get 9000 gallons of fuel oil per day trucked in to run backup generators--not easy when trees were blocking roads and fuel oil was scarce. Also fortuitous, the hurricane brought the Princeton area relatively little rainfall with the high winds. Heavy rains would have seeped via groundwater into aging sewers, adding substantially to the quantities of wastewater the plant had to process while it was running on backup power. In addition to Princeton, the plant treats sewage from West Windsor, Plainsboro, Pennington and part of South Brunswick. Princeton's share of total flow is 40%. Though 13 million gallons a day is typical, the amount of wastewater coming into the plant can vary considerably. Heavy rains can send addition water pouring down manholes or seeping from groundwater into leaky pipes. Some Princetonians have their sump pumps discharging not into the backyard or the street, but into the town's sanitary sewer (the one that takes wastewater to the plant for treatment, as opposed to the stormwater sewer, which pipes rainwater runoff directly into Lake Carnegie). This adds an unnecessary burden to the sewer system and expense that all of us have to bear. Of a total annual budget of $15 million, $2 million goes to electricity, and another million or so is spent on natural gas to incinerate the sludge. (Before natural gas dropped in price, the cost was more like $2.3 million/year.) Princeton's share, according to my notes, is $800,000 for electricity and $600,000 for the natural gas. Though they can point to "variable frequency drive" pumps and other efforts to improve efficiency, that's a lot of greenhouse gases Princeton is sending up into the atmosphere. I was surprised to learn that Princeton's sewage sludge, which one would think is relatively uncontaminated, is not being utilized for fertilizer. Philadelphia turns a portion of its sludge into a dried product that can be sold. Ocean County, NJ, sells its sludge as pellets. But back in 1978, state and federal funds were available to fund 90% of the cost of building an incinerator in Princeton, and the offer was too good to refuse. Though that might not be the approach they'd go with today, the Stony Brook plant is sticking with its incinerator for now. The ash ends up in the Warren County landfill. According to the plant manager, only 27% of New Jersey's sludge is incinerated. Some sludge is sent to Texas or Ohio for use on fields. There's some discussion of installing a large solar panel array on land behind the plant, which would supply 10% of the plants electricity. Wasted water down the drain = additional greenhouse gases up in the atmosphere. Along with finding ways to use less water day to day in the house, check the sump pump if you have one, and make sure it pumps the water outside rather than into the sanitary sewer. Princeton's sludge, which surely is some of the finest to be had, with substantial contributions from Nobel Laureates and other cultural elites, is not put to use growing prize-winning foliage but instead sent into firey oblivion and buried underground, never to return to the cycle of life. A New York Times article last year described New York City's effort to utilize its sludge for energy production and possibly also fertilizer. Here's a quote: "The biggest potential source of energy, officials said, is the methane gas from sewage treatment plants’ digesters. About half of the methane produced by the city’s plants is already used to meet about 20 percent of the energy demands of the city’s 14 sewage plants, whose electric bills run to a total of about $50 million a year. Now the city wants to market the other half, which is burned off and wasted." 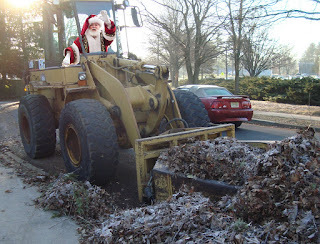 I was surprised to see Santa driving a Claw on Christmas Day. He must have noticed we had a few leaves left to collect when he came through on Christmas Eve, and was nice enough to return after he was done with his delivery gig to help out. Santa's amazingly generous with his time, but I guess that's what being Santa is all about. It may be, too, that he's checking out other lines of work, given that diminishing snow supplies are really posing a challenge for his sleigh/reindeer setup, and let's face it, in a couple decades his home at the North Pole will completely liquify every summer. New Jerseyans along the shore can relate to that. Usually around late fall, I summon considerable verbiage to rail against the custom of dumping leaves in the street. Over the years, I have documented in photos the mess, the hazard, the collective indifference to town ordinance, the cold-hearted rejection of nature's fertilizer, and the expensive dislocation of what should be the soil's protective blanket. Last year, I was even moved to verse, in an updated version of The Night Before Christmas. Yet each year, as one neighbor copies another, there are more leaves, until this year the streets were seamlessly lined in a "Me, too" tutti of rejected plant tissue. If it were a matter of aesthetics, if homeowners thought leaf piles to be unattractive, then the last place to put them is out on the curb where everyone has to look at them. With Hurricane Sandy's devastation added in, it seemed like the municipal powers that be could simply convert the streets into a composting operation, with windrows of plant matter already in place. It reportedly cost some $900,000 to haul 5000 tons of tree debris out of town. It's time to connect some dots. We have a scarcity of ethical energy. The energy we currently use seems clean, but is raising sea levels, acidifying the oceans, and radicalizing the weather. Warming of the planet leads to more energized atmosphere, stronger winds, and more trees down. We should be desperately seeking alternative sources to provide us with heat and electricity. Those 5000 tons of tree debris have a lot of energy locked up in their carbon bonds. The trees' carbon comes from the air, not from ancient underground deposits, so burning it releases no new carbon into the atmosphere. Instead of utilizing this climate-friendly fuel, however, we use more fossil fuel to grind it all up and dissipate all that energy in the composting process. Not only are the streets a perpetual mess, but the climate system becomes increasingly messed up as well. So let me slip into an imaginary world where people see the public space not as a dumping ground for leaves--and by extension, debt and climate-radicalizing pollution--but as something to cherish and care for. One small example: My neighbor, apparently animated by public spirit, raked leaves out of the curb rather than into it, and her portion of the street remained clean all fall. Right now, we have neither clean streets nor climate-friendly energy to show for the mess. The municipal workers, and apparently Santa as well, were heroic in their efforts to clean up after the hurricane. The compost at the Ecological Center has its uses. But by dumping yardwaste year-round on the streets and pumping ancient underground carbon into the atmosphere, the message is that we don't care about our shared spaces and our shared destiny. It's hard to believe that's how people really feel. Wednesday must be recycling day in the business district along Nassau Street. The rollout bins speak their desires on their lids--feed me papers, plastics, cans, but no styrofoam. Toddlers could come with such labeling, perhaps on their foreheads, describing all the things they will and will not eat. It would have made things much easier. and plastics #3-7. All of my considerable research on the subject indicates that recycling these items is now standard practice, and that the hauler and sorting plant for Princeton's curbside recyclables accept these items and consistently have markets for them. And yet municipal and county recycling staff have remained adamantly opposed to adding these items to the list. The county, which administers Princeton's curbside recycling service, says it wants the hauler and sorting facility to first "guarantee" that the additional items will be recycled. But that is logistically impossible, since it would mean tracking, to their eventual destinations, all of our recyclables, 60% of which are said to travel overseas to whomever is the highest bidder. Back when the kids were young, if they rejected one food I'd try another. But when the world seems to be rejecting common sense, I tend to keep feeding it spoonfuls in the persistent belief that it will eventually change its mind.